The FDA just turned away Alkermes’ approval submission for its new drug to treat major depressive disorder. 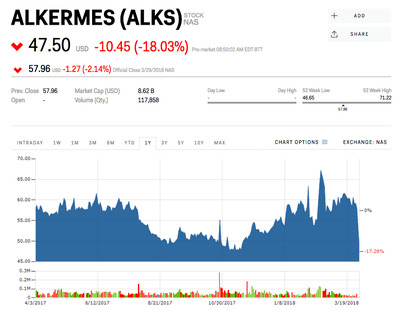 Alkermes‘ stock was down as much as 19% on Monday morning before markets opened. Alkermes said in a news release that the FDA told the company it wouldn’t review the drug because of “insufficient evidence of overall effectiveness.” Additional trials are needed before the FDA will review the drug. Alkermes plans to appeal the decision. “We are extremely disappointed with this decision and the implications for patients in the US suffering from major depressive disorder, a serious disease where there is a clear and urgent need for new treatment options for patients and their families,” Alkermes CEO Richard Pops said in a news release.